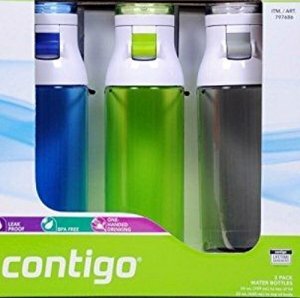 Contigo 24oz Water Bottles - Monaco - Citron - Smoke set of 3  - $14.00 : Big City Market, Big City Market Delivers it All! The Contigo 24oz On-The-Go Water Bottles are an easy and convenient way to take your cold beverages on the go. Each bottle features a unique flip top for simple one-handed drinking at the push of a button, a convenient carry loop for easy transport and the lid screws off to a wide mouth to easily add ice. Othere features include: Leak proof, lid prevents spills and leaks between uses and on-the-go, Fits in most car cupholders, convenient carrying and one-handed drinking, BPA Free, top rack dishwasher safe. These bottles are for cold liquids only. Not for use in a microwave or oven.